Getting married at any age is a wonderful thing. As you mature you want different things from a wedding dress. There are lots of elements to think about and consider. At Cutting Edge Brides we have lots of wedding dresses for older brides. Wearing a vintage style wedding dress is so versatile and you can choose to go veil or no veil. If you choose to wear a veil then there are so many options to decide between. Another alternative is to wear a birdcage veil or a stunning headpiece to give a real retro edge. As this gowns from our Timeless Chic range prove, wearing a veil or no veil, they look fantastic. This vintage style wedding dress is Gillian and is a great option for older brides. It has a flattering neckline and long sleeves with beaded embellishment that twinkles throughout the day. Older brides are often more daring in their short wedding dress choices. From a soft subtle colour like this gorgeous short wedding gown from House of Mooshki to a show stopping colourful dress. The choice is yours. 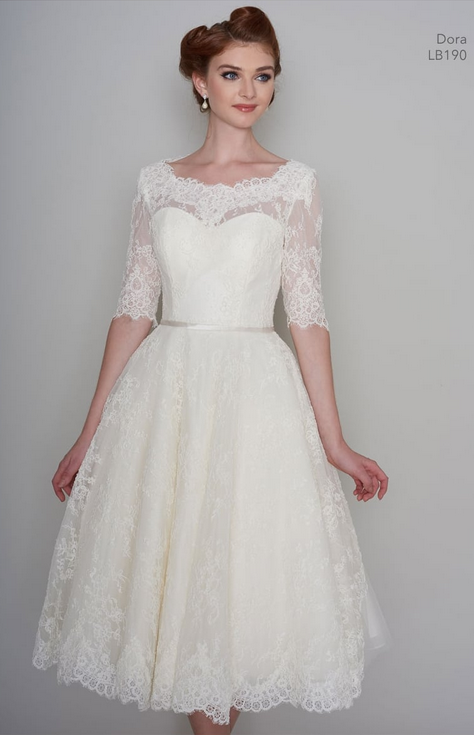 Poppy by House of Mooshki, beautiful tulle and lace vintage 1950s inspired wedding gown with cap sleeve and button back. It has a wonderful soft pink colour that sets this dress apart. Not everyone feels confident as they get older on showing as much flesh. Or it could be that you know your style and what suits you. Either way we have lots of options if you want options. Wearing an illusion neckline vintage style wedding dress could work. This gives you the feel of a strapless dress with the added security of a sheer layer. 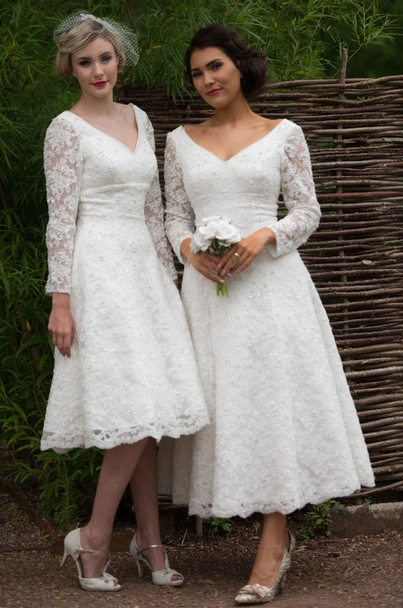 Molly Mae by Brighton Belle is a beautiful tea length wedding dress with a 1950s retro edge. Featuring a pretty vintage inspired Lace edge sheer illusion neckline and a full Fifties style skirt, this dress is ideal for the bride seeking something sassy and chic. A zip up back with button trim and a sheer back finishes the look. Or add a bolero or jacket to give you the option of removing it at certain times during your wedding. Elizabeth by Timeless Chic is a fantastic polka dot tea length wedding dress. This gorgeous retro strapless lace and polka dot tulle wedding dress is paired with a beautiful 3/4 sleeve matching bolero jacket. Sleeves on a retro wedding dress are so flattering whatever the style of wedding you are having. Dora by Loulou Bridal is a tea length vintage lace short wedding dress with half Sleeve. The stunning lace back is finished with flowers which can be removed. This is a very feminine dress with a sweetheart neckline that flatters most body shapes. There are fantastic wedding dresses for older brides with short sleeves and long sleeves. All of our retro wedding dresses can be customized to whatever length sleeve you require. If you would like to try a short wedding dress please contact us today. Your one to one appointment will focus on what elements your wedding dress needs to have. There are over 150 designer wedding dresses in our Bexley Boutique and you are sure to find the perfect one. For more inspiration visit our blog where we feature real brides and lots of great tips.